Since moving from Outlook (Exchange) to eM Client (Google) a few weeks ago I have needed to find a suitable task management application to replace Outlook’s excellent task tool. I’ve found a really nice application in Todoist. Must sync quickly between mobile and desktop. Must have a native app for both Android and Windows 8. Must be able to handle multiple contexts/projects. Should have a usable Android widget to both add new tasks and view a particular context/project. 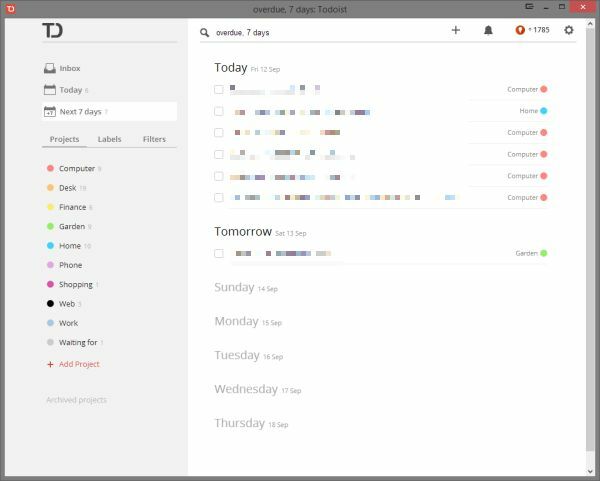 Wunderlist (Windows 8 modern UI app) is really pretty. The first application that I consider was Wunderlist which I had trialled a few years ago before moving to Exchange. I thought it was time to give it another go. I migrated my tasks into Wunderlist and used it for a few days. I really love the aesthetics of Wunderlist. It looks uncluttered and simple, and I selected a rich wood-effect background to complement the dark grey wood wallpaper both my PC and smartphone. Following the GTD methodology, I was able to create multiple contexts (e.g. computer, desk, finance, garden, home, shopping, etc.). Moving tasks from one context to another is as simple as dragging and dropping tasks. Further details can be added to individual tasks (due date, reminders, subtasks and notes). I really liked the ability to star important or favourite items, and to view all tasks, grouped by context in the order shown on the left-hand sidebar. Wunderlist was looking promising, and I probably would have continued to use it had it not been for two issues. The first issue I had was more of a niggle: the Android widget it really fiddly to use. I love that you can scroll left and right between contexts but I found with my not-too-enormous fingers that I had to jab at the screen four or five times to hit the sweet spot before it moved. The second is a known problem: there are sync issues between Wunderlist 2 and 3. The web interface and Android both use the newer version 3, the Windows 7 application uses version 2. When I used both in conjunction I discovered discrepancies in my data. I didn’t want to use the Windows 8 modern UI app or have to access my lists through Chrome, and the niggle with the Android widget was enough to get me looking elsewhere. Trello uses the model of cards pinned to lists. I’ve long been a fan of Trello from Fog Creek Software. We use it extensively at work, and I use it to manage all my personal projects. So I quickly migrated my tasks from Wunderlist to Trello and used it for a few days. As much as I love Trello for managing larger projects I didn’t really warm to it as a simply list/task application. Contrary to my experience with Wunderlist, I was quite happy to use the web interface but then that’s how I have used it for the last few years. The Android app is great and improves with each release. The Android widget didn’t give me the information that I needed, though: it isn’t granular enough for my requirements. All it offers is a list of cards assigned to me, optionally grouped by due date. The problem here is that it lists EVERY single card assigned to me, starting with those cards that are dated in the past. Right now that is 461 cards. All I wanted to see was all the cards within a particular board, or even better within a particular list on one particular board. Todoist has a very clean interface. That was when I discovered Todoist which appears to be available for just about everything: web, Android, iOS, Windows, Mac OS, web, Outlook, Thunderbird, Gmail and Postbox. I’d love to see a plugin for eM Client—that would make my productivity life complete! Todoist has a very minimalist and uncluttered look. On the left are your contexts, which Todoist calls Projects. It also offers labels and filters, but I don’t use either. For the third time in a week I migrated all my tasks to yet another application. But this time they’ve stayed there… the ones that I’ve not checked off. Todoist has met all my requirements. 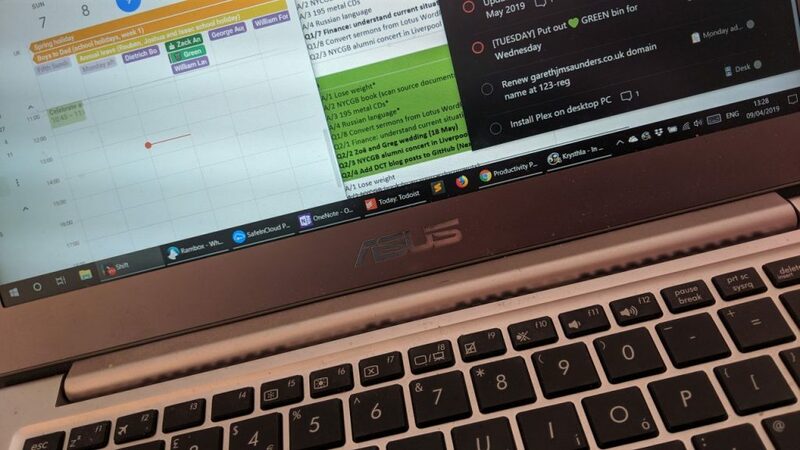 It is cloud-based, the Windows and Android apps work beautifully, I can add multiple contexts/projects, can easily drag and drop items from one list to another. The Android widget does exactly what I need as doesn’t suffer from the same navigation issues that I experienced with Wunderlist. I’ve found that I use that a lot now, and the big plus (+) in the top-right corner of the widget allows me to add tasks quickly to any of my existing lists, and assign a due date too if I need. CORRECTION: I’ve discovered a “View all” option listed under Filters. This lists all tasks by project. I wish there was a shortcut for this at the top of the application. What is quite fun too is that Todoist shows your productivity trend and gives you points (which it calls ‘Todoist Karma‘), which I guess is there to help motivate you. My productivity trend for the last seven days. When you tick off items your points go up, when you don’t your points down. I’ll definitely be sticking with Todoist for the foreseeable future, and I may even buy the upgrade to Todoist Premium which is a snip at GBP £18.00 per year, which gives you more project and label colours, task notes and file uploads, reminders, iCalendar feeds, etc. For the last 14 years I’ve used Microsoft Outlook to manage my life. 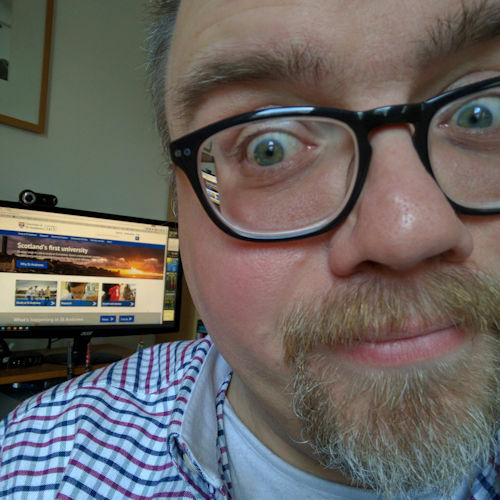 Last week, with some trepidation I moved to Google (Gmail, calendar, and contacts) and something else for tasks (I’ve not quite settled on it, although Todoist is currently a very strong contender). I thought it may be useful for others in a similar situation to document my experience. Over the years I have used Microsoft Outlook 2000, 2003, 2007, and most recently 2010. I have synchronised it with various Psion handheld computers, with Windows Mobile, and I’ve used it for the last four years with a hosted instance of Microsoft Exchange 2010 from the excellent, UK-based Simply Mail Solutions. 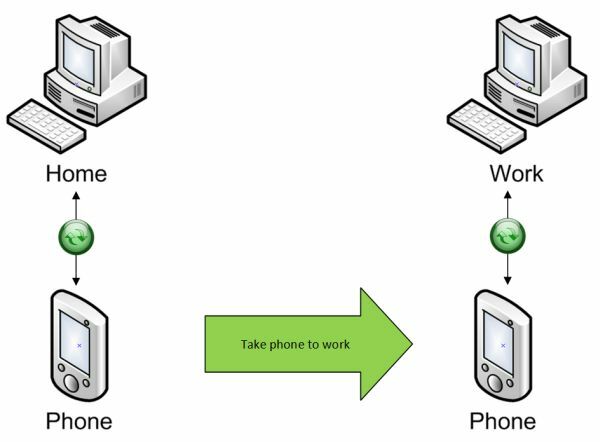 I moved to Exchange in 2010 mainly because I was having issues synchronising my Windows Mobile phone via ActiveSync with two PCs: home and work (below). Synchronisation didn’t always work successfully and I had no end of problems: duplicated, missing or deleted content. Enough was enough, so I looked at the options. Workflow for using ActiveSync with two instances of Outlook. I found this caused all sorts of problems when using the phone as the ‘golden copy’. At that point, in 2010, I considered moving to Gmail but Windows Mobile 6 didn’t support Google data particularly well and I had no real need to share my data with anyone else but myself. My main concern was synchronising data between devices not between people. So I research the options and in the end I moved to an Exchange 2010 account rented from Simply Mail Solutions. It cost me around £70 per year, plus my domain name. But I felt that cost was worth the expense when set against lost time and frustration due to synchronisation failures. 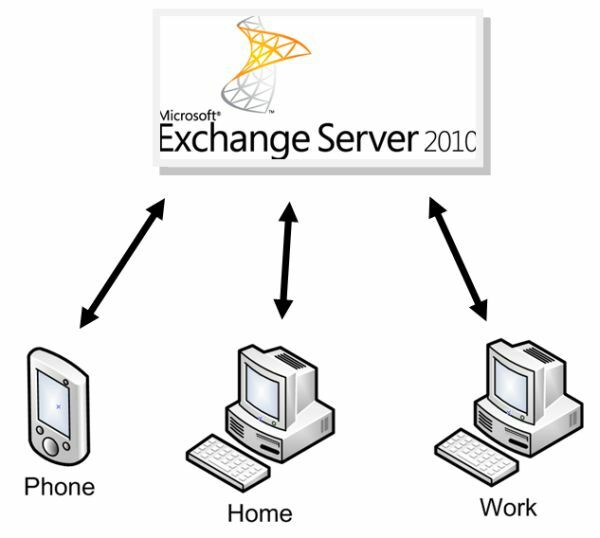 With this model everything was synchronising with the Exchange server in the cloud. It was fast, it was efficient, and I never once had an issue with duplicated or missing content. I could add a task on my phone during my walk to work and when I got to the office it was already there on my PC. It felt like magic. Why move to Google, then? What has changed recently though is that now I do need to share my data with (my wife) Jane. To add another user to Exchange was going to be expensive and unnecessarily complex, particularly when you factor in which domain names we use and that Jane was already using Google mail. The logical conclusion was for me to move to Google. One of my hesitations about moving lock, stock and barrel to Google was that I’m not particularly fond of the standard Gmail or Google Contacts interface; Google Calendar is okay; Google Tasks is terrible. As I said, I’ve used Outlook for a long time. It’s become very familiar and some of the workflow processes have depended on features exclusive to Outlook. I would need to find something else, as Outlook’s support for Google doesn’t extend much beyond IMAP support for Gmail. If you want to synchronise your Google Calendar with Outlook you can forget it: it’s a clunky business at best, and impossible at worst. Someone I follow on Twitter mentioned eM Client which claims to be the best email client for Windows. I gave it a go, trialled it alongside Outlook for just a week and decided that although it lacks a few features that I really like about Outlook this was perfect for my needs. I will write a more complete review of eM Client in a later post. 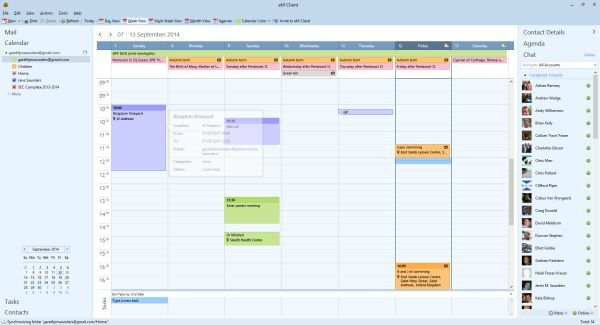 Like Outlook I like that everything is together: email, calendar and contacts. I decided not to use the tasks as support for Google Tasks isn’t great even on Android. 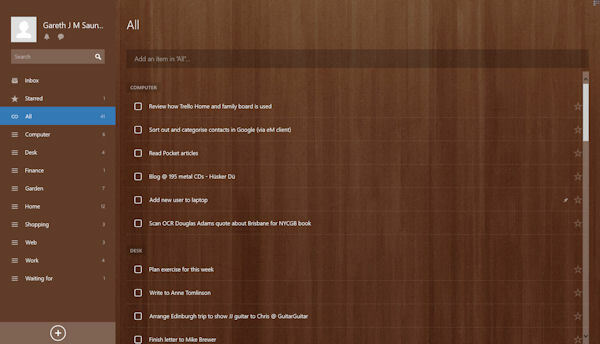 For a week I trialled Wunderlist, which is one of Lifehacker‘s favourite to do apps. I’d tried it before but after a week I still wasn’t convinced: I wanted to use their Windows 7 client but it simply wouldn’t synchronise with the Android app, plus the Android widget was clunky. So I gave up. That’s when I stumbled on Todoist, which I really like. The Android app is clean and simple, the Windows app just works, it synchronises really quickly, and the widget is perfect for my needs—it does what I need, and works the way that I want it to. I expect that I will stick with Todoist for the near future. Synchronise Outlook calendar and contacts data with Google using demo version of Sync2. It allowed me to copy all my data from Exchange to Google Calendar and Contacts with no restrictions. Add Gmail account to Outlook as an IMAP email account, then copy (or move) emails from Exchange/Outlook account to Gmail. With everything moved over and essentially backed-up to Google, change MX records in my domain name DNS. Basically, this tells all email to go to my web hosting company (Heart Internet) rather than my Exchange server (hosted by Simply Mail Solutions). The DNS took about 4-6 hours to update. Create a forward for my email address so that it all gets passed on to Gmail. I did this within my Heart Internet control panel. Install eM Client and add my Google account. All my data, email, calendar, and contacts is then synchronised with eM Client. The nervous bit was waiting for the DNS to update, as you need to set the MX (mail) records correctly otherwise it doesn’t work. But as soon as my [email protected] emails started trickling into my Gmail account I knew that everything was fine. So far I’ve been using this set up for a couple of weeks and I’m really appreciating having only one place to check email; I’m loving that Jane and I can see each other’s calendars so easily. I think this is going to work. I wish I’d discovered eM Client and Todoist before now.